MORE is opposed to the Common Core standards because they are inextricably linked to a reform package that includes punitive high-stakes testing, unproven and unreliable measurements of student and teacher performance and scripted curriculum produced not by teachers, but by corporations. After 30 years of manufactured crises and failed solutions, the elements of this package, including the standards, are being used as ideological battering rams to attack the very concept of public education, replacing it with a profit-making privatization scheme. The Common Core standards are undemocratic. They were written without meaningful teacher input, and educators do not have the freedom to use them as they see fit. The standards also take the focus away from the development of the whole child, de-emphasizing critical thinking. 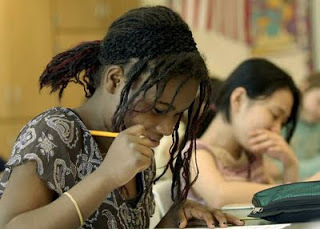 While appealing even to people opposed to the rest of the corporate education reform “package,” the standards minimize student-centered and culturally-relevant curricula generated at regional levels – and popularized thanks to the work of the Civil Rights and Women’s movements – and they shift power away from teachers, parents, and communities. The Common Core is the culminating achievement of the three-decade long corporate attempt, beginning with the 1983 Business Roundtable’s “A Nation At Risk” report, to control and profit from national standards. The report branded the nation’s schools as “failures” and pointed the finger at teachers as being part of the problem. The American Federation of Teachers (AFT) and NYC’s United Federation of Teachers (UFT), the very institutions that were supposed to protect teachers and public schools from unproven assaults, endorsed the report. Thus, a pattern was set of union collaboration with business interests looking to undermine the power and influence of teacher unions, a collaboration that still exists today as evidenced by union support for the Common Core. Furthermore, in serving the needs of corporate America, the Common Core standards prioritize “college and career” readiness over, and to the detriment of, civic-mindedness, student health, and social and emotional growth. MORE does not encourage NYC public school teachers to refuse to administer the tests without legal support and without seeking advice and solidarity from their union brothers and sisters at their schools.